A physician's certificate of age for Saba Sfier created on June 8, 1923. It confirms their date of birth as June 8, 1907 in Syria. It lists their address as 284 Elm St.
A handwritten letter by Mary E. Leary, Principal of the Amesbury Street School, on September 7, 1921. It certifies that James Hassey was born on February 7, 1907. A handwritten letter in Arabic from Priest Koury Mikael Koury, written on July 20, 1907. It is also translated into English. It certifies Elias Mousa Bicharah's birthdate as August 2, 1893 and his baptism date as September 1, 1893. 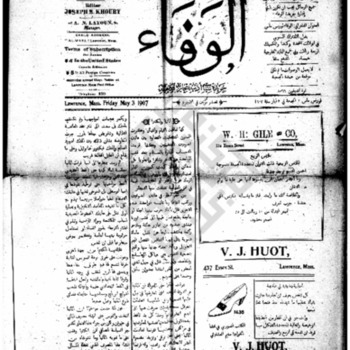 An issue of al-Kown dated October 24, 1907.